James Pannafino’s Typographic Comics: Anti-illustration? James Pannafino teaches graphic and interactive design at Millersville University of PA. I recall having James in my illustration class at Kutztown and he has a quirky sense of humor, – so I wasn’t sure if he was kidding about his next big idea:Typographic Comics. He must be serious, he’s lectured at Harvard! Looking at the sample above and those on his website one is reminded of the concrete poetry movement. 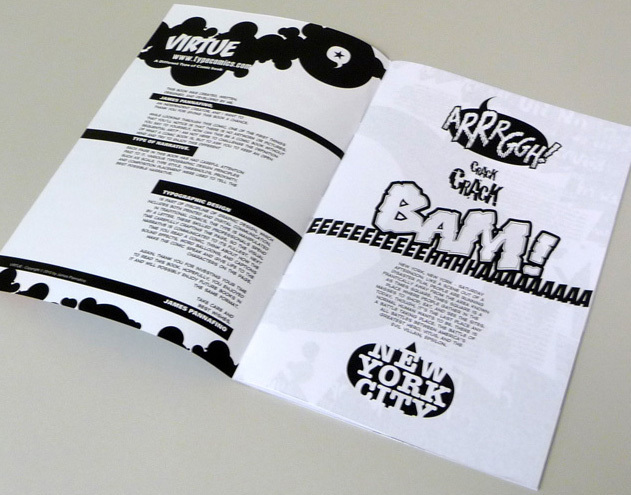 James has completed a typographic comic book called Virtue and is now working on getting it published. He will expound on his typographic experiments at The Museum of Comic and Cartoon Art, 594 Broadway, New York City, Thursday, July 22nd, 7pm. Admission: $5, or free for MOCCA Museum members. James has already published a more traditional book, Common College Sense: The Visual Guide to Understanding Everyday Tasks for College Students. This How-to book includes illustrations by some of his Millersville University students and is available at Amazon.com. James has graciously offered to come speak to a KU illustration class about these projects. We hope to see him in the fall, or sooner, if we get to the MOCCA event. By the way, checking the MOCCA website reveals there will be two amazing exhibitions on the walls the night of James Pannafino’s lecture. NeoIntegrity: Comics Edition shows comics-related works by over 200 artists; here are just five names to give an example of the diversity: Kaz, Milt Caniff, Jack Kirby, Big Daddy Roth and William Butler Yeats! A second exhibit showcases R. Sikoryak’s most ambitious comic book project, his 2000’s “Dostoyevsky Comics,” which adapts Crime and Punishment in the style of a 1950’s golden-age Batman comic. Both exhibitions run until Aug. 29, 2010.